I bought this specimen as Microcyphus keiensis, but this was apparently a wrong taxon. 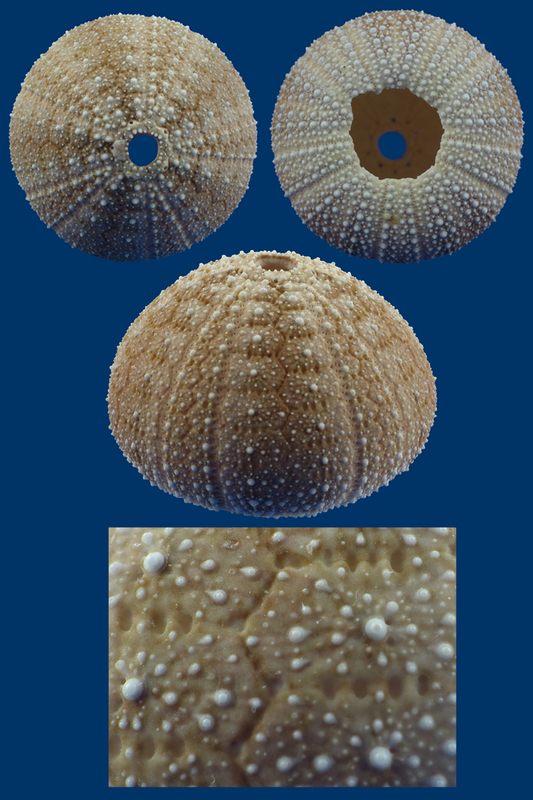 In my literature, e. g. Heinke Schultz, Sea Urchins III, page 1214, I found the genus Printechinus characterized by narrow, more or less vertical depressions crossing the horizontal sutures between the primary (non-crenulate, non-perforate) tubercles. There are two extant species. P. impressus Koehler 1927 and P. viridis Mortensen 1942. P. impressus has naked median zones.. P. viridis has no naked median areas thus fitting better with the present specimen. In Th. Mortensen, A Monograph of the Echinoidea, III.2, Camarodonta 1, page 312, one can read for P.viridis " The sutural depressions are small but distinct, four or five to each horizontal suture, the two adjoining the the primary tubercle are distinctly elongate". In the "Key to the recent species of Printechinus" the tubercles are described as non-crenulate. In the Echinoid-Directory (www.nhm.ac.uk/our-science/data/echinoid-directory/taxa/taxon.jsp?id=1323) the tubercles of both species, namely P. impressus and P. viridis are regarded to be crenulate. Who is right, Th. Mortensen or the NHM? I, for my part, believe, that Printechinus viridis is the correct taxon. If you have a better idea, please, tell me (Clarenbach-Haan@t-online.de)!